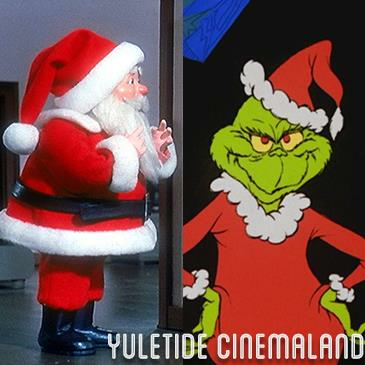 FEATURE: A Christmas Story, The Year Without a Santa Claus, & How the Grinch Stole Christmas! ABOUT A CHRISTMAS STORY: In the 1940s, a young boy named Ralphie attempts to convince his parents, his teacher and Santa that a Red Ryder BB gun really is the perfect Christmas gift. ABOUT THE YEAR WITHOUT A SANTA CLAUS: When a weary and discouraged Santa Claus considers skipping his Christmas Eve run one year, Mrs. Claus and his Elves set out to change his mind. ABOUT HOW THE GRINCH STOLE CHRISTMAS! : A grumpy hermit hatches a plan to steal Christmas from the Whos of Whoville. TIMES: Doors 5:00pm. Tours 5:15-6:00pm, 6:30-7:30pm, 8:00-9:00pm. Claus 5:30pm. Grinch 6:30pm. Story 7pm. Claus 8:40pm. Grinch 9:40pm. FOOD TRUCKS: Visit www.streetfoodcinema.com/triple-feature-dec-15 for the most current Food Truck listing! PARKING: Suggested lot on 3545 Pasadena Ave for $10 online, $15 on the day of. Lot not owned or operated by SFC. We suggest carpooling or Uber/Lyft (to 3500 Pasadena Ave). VIP Parking Passes available for $18 online, $25 on the day of. Free street parking around 3545 Pasadena Ave limited.